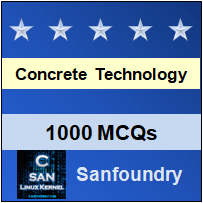 This set of Concrete Technology Multiple Choice Questions & Answers (MCQs) focuses on “IS for Concrete Mix Design”. 1. IS code for Specification for ordinary Portland cement, 33 grade? Explanation: IS 269:1989 code is for specification for ordinary Portland cement of 33 grade. This standard covers the manufacture and chemical and physical requirements of ordinary Portland cement. 2. IS code for Specification for coarse and fine aggregates from natural sources for concrete? Explanation: IS 383:1970 – Specification for coarse and fine aggregates from natural sources for concrete. 3. IS code for Specification for Portland slag cement? Explanation: IS 455:1989 is for specification for Portland slag cement to the need of civil engineering. 4. IS Code of practice for plain and reinforced concrete. Explanation: IS 456:2000 Code of practice for plain and reinforced concrete to the need of civil engineering. Explanation: IS 457:1957 Code of practice for general construction of plain and reinforced concrete for dams and other massive structures. Explanation: IS 1489(Part 1):1991 Specification for Portland pozzolana cement Part 1 Flyash based. Explanation: IS 1489(Part 2):1991 Specification for Portland-pozzolana cement: Part 2 Calcined clay based. Explanation: IS 1727:1967 Methods of test for pozzolanic materials to the need of civil engineering. Explanation: IS 650:1991 Specification for standard sand for testing of cement to the need of civil engineering. Explanation: IS 1199:1959 Methods of sampling and analysis of concrete to the need of civil engineering.